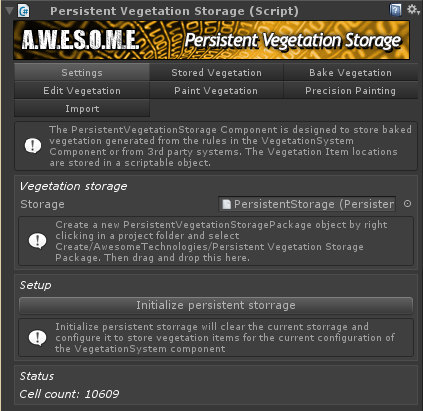 In order to work the Persistent Vegetation Storage component needs a PersistentVegetationStoragePackage. Create a new package and drag and drop it to the Storage slot in the inspector. The first time a package is added or if the package is initialized for another terrain it will as you to initialize it. When initialized it will work for only this terrain with the current vegetation cell size. If you change the cell size you need to initialize the storage again. This will clear all data in the storage.